Direct Venkat Prabhu, whose ‘Biriyani’ is running to packed houses, met the press yesterday 23rd December 2013, at Green Park Hotel in Vadapalani, Chennai. 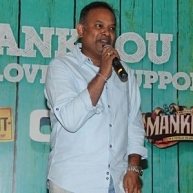 Venkat Prabhu took the opportunity to thank all his producers, and expressed special gratitude to his friend and producer of his first film SPB Charan. He said that the people love to see him being trolled and that he takes it as a part and parcel of being in the cinema industry. Finally, he thanked the media for the support and love extended to all his films. Ilayathalapathy Vijay to return the favor? Is Ajith Playing A Cameo Role In Venkat Prabhu's Biriyani? People looking for online information on Biriyani, Studio green, Suriya, Venkat Prabhu will find this news story useful.